8” x 8” scrapbooking layouts are great if you are limited for time or want to display your treasured memories in photo frames. Trimcraft also sell beautiful 8”x8” scrapbooks to keep your layouts in. 1. With the First Edition Kaleidoscope 8” x 8” paper pad, I cut several strips of paper. Cut the inky navy and green paper to 1.7cm x 15.2cm and another piece of the same paper to 15cm x 2cm, then cut the left and right corner off at an angle and cut roughly in half. 2. With the pink, orange and purple paper, I have cut a strip of paper to 10cm x 1.45cm and cut a fishtail on one end. With the same paper, cut a piece to 9.9cm x 1.5cm and cut one corner off at an angle. 3. With the orange, pink and blue inky paper, cut a piece of paper to 2cm x 4.7cm and another to 10.7cm x 1.9cm. Cut a fishtail design on one side on both strips of paper. With the piece of white, blue and teal paper cut it to 1.2cm x 14.3cm and cut both corners off at an angle. 4. I have planned to position my image to the left side of my layout so on a piece of First Edition Kaleidoscope 8” x 8” distressed green paper; I have placed the majority of my cut outs to the left side of the layout and two horizontally to the bottom centre. Once you are happy with your layout, stick down the paper strips. 5. Add droplets around your page layout by unscrewing the DecoArt cap and carefully flicking it around the top and centre of the page. Remember to protect your work surface. 6. While the ink is drying, I have die cut a medium heart and stuck it to the centre of the bright pink mini peg and decorated the heart by adding a pink enamel dot. 7. I added my 9.2cm square image on top of the strips of paper using foam squares and attached the mini peg to the top right of the photo. I have decorated the bottom of my photo by adding two small accordion stickers to each corner and then add a larger accordion sticker to the middle. 8. Using the SANTORO®'s Willow die set, I have cut three hearts from the First Edition Kaleidoscope paper and added them to the top of the layout. 9. With a piece of grey foam, I then die cut the words ‘Beach Walk’ using the First Edition Varsity Alphabet die set and glued next to the photo. 10. Finish by adding a small and large enamel dot to the top of the scrapbook layout. I also made this fun ‘Mischief’ scrapbooking layout to show you how to frame your images using the Dovecraft Photo Frames. 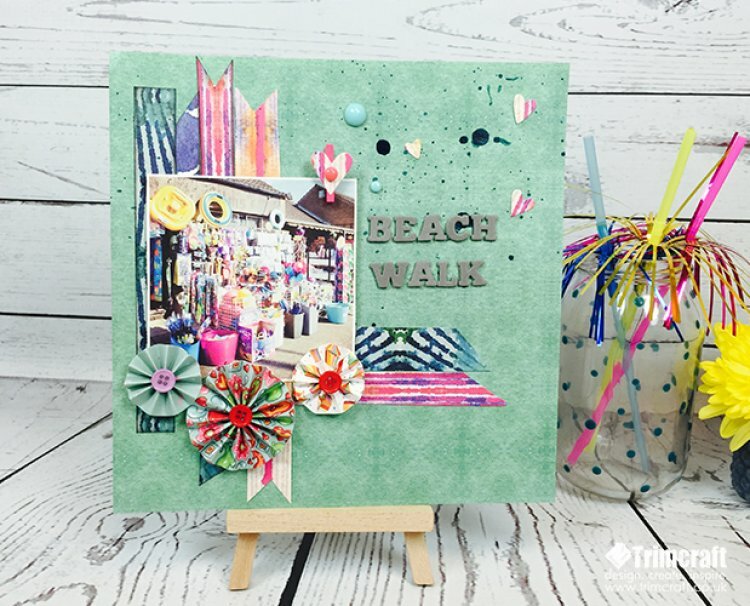 Have you been inspired to make an 8” x 8” scrapbooking layout? We would love to see your scrapbook creations in the project gallery.